Preissler Media Services provides quality website design, maintenance and optimization. Preissler Media Services is able to create websites using wide amount of mediums including: animations, architectural graphics, flash, graphics, illustrations, scripting /programming languages, slide shows, video, virtual reality interiors, panoramas, objects and photographic imagery. Each website is strategically optimized, tagged and registered with the most popular used web searching engines pertaining to your industry, activity or organization. Electronic commerce features (shopping carts) are offered. Webpages can be used for demonstative, marketing or educational kiosks. Data gathering forms through local and inter office intranets. Basic Webpage: Pre-existing (pre-designed, generic) Template. Up to 500 words text (customer furnished); 6 pre-scanned images (customer furnished); no external links (url); no internal links (url; and Tagged and registered on popular search engines; and Installed on host. (hosting setup and fees not included). Custom Webpage: Non Pre-existing Custom Designed. Up to 500 words text (customer furnished); 6 pre-scanned images (customer furnished); no external links (url); no internal links (url); Tagged and registered onpopular search engines; Limited to two design changes; and Installed on host. (hosting setup and fees not included). Additional Page, Pre-existing (pre-designed, generic) Template: Up to 500 words of text (customer furnished); 6 pre-scanned images (customer furnished); no external links (url); one internal link (url); and Installed on host. (hosting setup and fees not included). Additional Page, Custom Page, Non Pre Existing Designed: Up to 500 words of text (customer furnished); 6 pre-scanned images (customer furnished); no external links (url); one internal link (url); and Installed on host. (hosting setup and fees not included). Custom Animations, Slideshows, Music Enhancements: Hourly charge, $75.00 per hour. Custom Illustrations, Graphic Design: See Preissler Media Services Graphic Designs, by pressing button link below. Photo Touch-up: Hourly charge, $75.00 per hour. 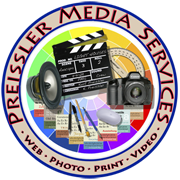 Custom Photography and Video: See Preissler Media Services Photography, by pressing button link below. Custom Logo Design: See Preissler Media Services Graphic Designs, by pressing button link below. Stock photography, illustrations, Video, Animations, Quoted Text: Subject to licensing and use fees by various publishing agencies. All art provided by customer must be signed off and/or licensed for specific use on website, or any other specific media use or can not be used. 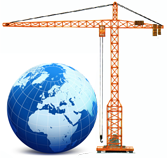 Website Maintenance: Per month charge, depends website size and on host location.